Artist Riikka Keränen’s sculptural installation Mushrooms of the Mind has been completed at the Alppikylä day care centre, which opened in 2016. The work consists of clusters of ceramic tree mushrooms of different shapes, colours and sizes. The mushrooms contain both fantastical elements and features of natural mushrooms. 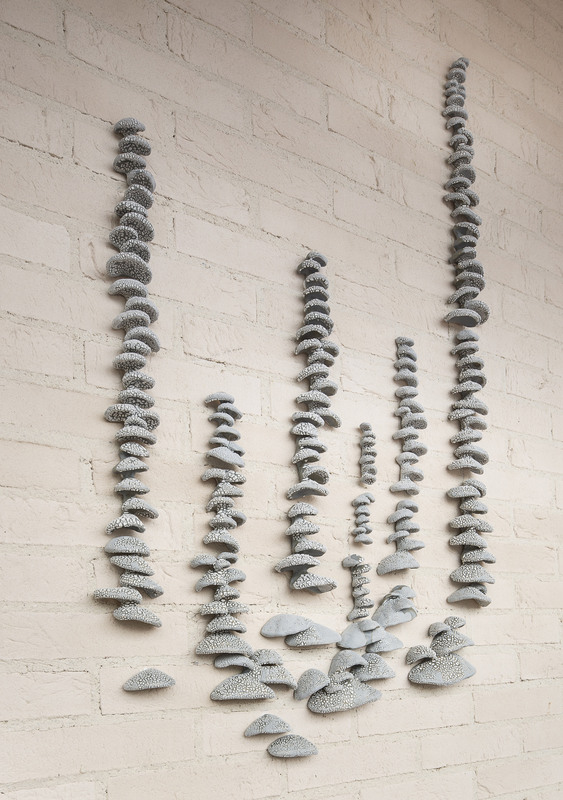 Clusters of mushrooms are installed in several parts of the building, forming a link between the interior and exterior spaces. Riikka Keränen (b. 1984) examines our relationship with time, nature and materials in her art, seeking to understand the foundations of life while investigating the alienation of our culture from them. Keränen studied art at Aalto University’s Visual Culture and Contemporary Art master’s degree programme. Born in the province of Kainuu, Keränen had previously studied at the Satakunta University of Applied Art in Kankaanpää and the Art School in Liminka. In the period 2016–2018, HAM’s non-museum operations will focus on the Jakomäki district under the title It’s Raining Art. The purpose of the project is to promote inclusion and the accessibility of art to local residents. An educational pilot project introducing the artwork, its world and its maker was conducted at the day care centre prior to instalment. Mushrooms of the Mind has been produced under the Percent for Art programme. HAM serves as the expert in numerous Percent for Art projects in Helsinki. Under the programme, one percent of the cost of new construction or renovation is used to acquire art for public space. The programme has become increasingly prevalent in recent years, with artworks raised in many public buildings and spaces in the districts of Kalasatama, Pihlajamäki, Töölönlahti and Ruoholahti.